PRODUCTS - HOME ALARM SECURITY SYSTEMS VANCOUVER HOME ALARM SYSTEM LOWER MAINLAND BRITISH COLUMBIA customized to your security needs - INSTALLATION, SERVICE and MONITORING. Hardwire Security Alarm Systems are demonstrated to be better than WIRELESS SECURITY ALARM SYSTEMS. 2 Way voice, video verification and environmental monitoring for water leakage, temperature and freezer alarms, humidity, gas, carbon monoxide and more MOBOTIX IP CAMERA INSTALLER and Technician. At KeepSafe Systems, we do not like to tie ourselves down to only one particular manufacturer. For that reason, KeepSafe Systems clients, can be assured they will have access to all the best products available in the security alarm industry. Of course, there are certain security alarm manufacturer's we prefer, we will never force you into having a particular brand of security alarm system installed in your home. If you happen to like another brand better than any of our regular brand security alarm panels.... not a problem. It is all about fulfilling your individual security alarm system needs. Anyone who knows me knows how much I truly Hate wireless security alarm systems. Not only are they problem ridden, they also provide little or no room for future upgrades or changes in technology. All that aside, there are some instances where wireless is the only option. Now before you wireless supporters start jumping up and down thinking I am finally taking your side... I am talking about wireless medical alert buttons. In cases like this, portability is the issue. In the past, I have not really moved into the wireless medical alert systems beyond a simple wireless medical alert FOB connected to an existing hardwired security alarm system. I just discovered a funky little product which completely changes the whole wireless panic alarm / 2 way voice industry. Yes, we have all heard the commercials, this, however, is different and a far better option. The problem with traditional 2 way voice medical Alert systems, and the main reason I have not gotten into marketing them, until now, is the Two-Way-Voice portion has been... well kinda useless for the average home. You see, at the heart of every Medical Alert System is a base station. This is the main box, which usually sits next to the telephone, in the living room or in the bedroom, contains the speaker and microphone. So, when you press your wireless panic button, a live two way voice channel is opened up between you and the Central Monitoring Station. The thing is, that communication ends at the base station. So, if you are in the living room, bedroom or wherever the base station is located. You can communicate with the operator. Panic alarms have long been part of the security alarm industry, as have "Dead man" or "Operator Down" systems in monitoring stations where it is imperative operators are available 24/7. The concept of a Lone Worker, "Man Down" or "Dead Man Switch" is quite simple. A local timer which activates a buzzer that requires the pressing of a button within an allotted period of time. If the acknowledgement button is not pressed within the required time period, another monitoring station is notified and the appropriate authorities are dispatched. Recent government regulations on Lone Worker's require that all workers working on their own must have some sort of safety monitoring system in place. KeepSafe Systems Lone Worker Monitoring system is the ideal solution. As with all Systems designed and installed by KeepSafe Systems, the KeepSafe Systems Lone Worker monitoring system is completely customized to your needs. The number and location of verification buttons can be located in area's convenient and important to your business. There is also no limit to the number of buttons installed in a particular location. Lone Worker Buttons can act together, where the worker simply need press any of the buttons, or separate area's of the site can have their own Lone Worker buttons on the same or different time schedules. Response to the Lone Worker system is also customizable to your own personal needs. The important thing to know is KeepSafe Systems operators are available for your workers 24/7 365 days a year. In addition to standard time based Lone Worker Systems, KeepSafe Systems also has 2 Way voice panic alarm systems available. These are typically used as Medical alert systems, however they are also ideal for Lone Worker applications where the worker moves around alot during their shift. Unlike the old style wireless 2 way voice systems you hear about on the radio, the KeepSafe Systems Medical Alert System has the speaker and microphone included in the portable pendant. That way, your worker can get in contact with the 24/7 KeepSafe Systems Professional monitoring station whereever they are within the coverage area of the portable 2 way voice panic alarm pendant. For More information or to arrange for KeepSafe Systems to design a custom Lone worker Monitoring System for your companies specific requirements, please feel free to contact us 24/7 at 604-874-8772. Your security needs do not take weekends off, so neither do we. KeepSafe Systems clients can be assured we are available for you when and where you need us. Blind spots and obstructions are always a concern when in comes to space protection. It is quite common for articles of furniture to be moved and dividing walls to be placed in a position as to block the coverage pattern of a motion detector. Ceiling motion detectors are not new to the security alarm industry, in fact they have been around for quite some time. 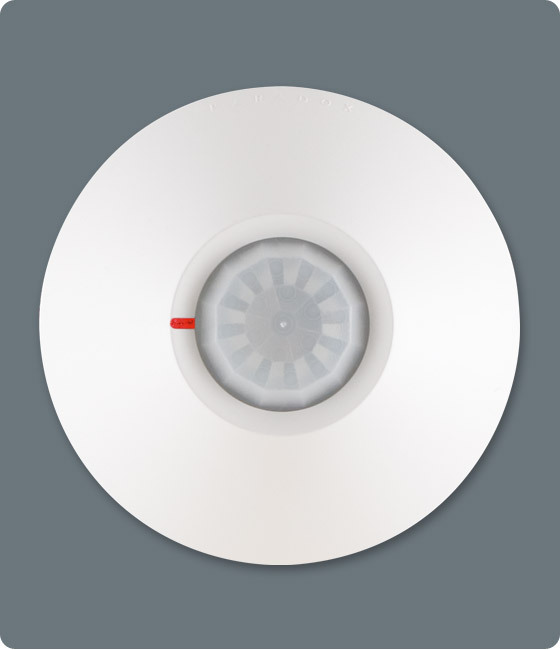 However, like the glassbreak detector, the ceiling motion detector has be widely underutilized. The primary reasons being cost and occasional difficulty average installers have in installing them in retro-fit situations. Luckily, KeepSafe Systems does not employ "Average Installers." Unlike traditional corner mount motion detectors, 360 degree ceiling motion detectors look down on the scene, therefore, most items which would block the horizontal plane have no effect on the "view" of the 360 degree ceiling motion detector.